Now the Cork & Bottle primarily a wine bar. Went back here recently just to see what the place was like after a four year hiatus. It's not bad, clean and well kept, food was nice, but really... with the abundance of great pubs in Camden and the vicinity offering decent selections of new and different beer and ales, the feeling I got was just, meh. Pretty empty for a weekend, no buzz at all, televisions showing soccer, and other than an acceptable range of four ales on tap, the exact same fare as any other franchised pub in north or south london. Bit of a shame, it's a good looking pub, and i think it has HUGE potential to be a really classy watering hole with some excellent, edgy food and beer on tap or in the bottle. Just feels like a well-presented clone of so many other places dotted around london right now. 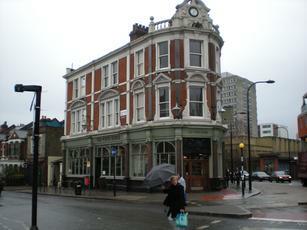 Alas the last pub (PUB) in South End Green is dead. A buzzing, spacious place now feels like a small claustrophobic living room. Duck egg blue colour scheme, awful wallpaper, copper bar, leather banquettes, mean sized small tables, frosted windows obscuring the world outside, no TVs and on a Friday night and empty apart from a couple with a whingeing toddler in the corner. No old pics of Hampstead, no character, no soul, I might as well drink in my personal mental image of Hell. Awful just awful. I am shell shocked. This refurbishment is a criminal act. Crying shame. 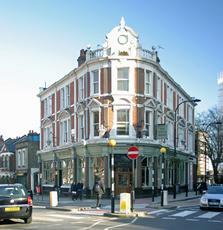 Head and Shoulders above any other pub in NW3 ? Im assuming this is a wind-up ! Having lived in NW3 for 6.67 years, and drank/socialised here for 15, I can honestly say that this isnt even the best pub in South End Green , let alone NW3 as a whole ! Its a terrible, horrible place . I recommend you spread your wings further up the hill my friend !